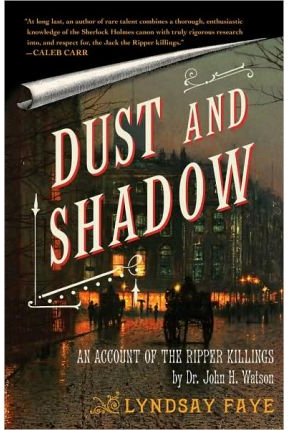 In Dust and Shadow Sherlock Holmes hunts down Jack the Ripper with impeccably accurate historical detail, rooting the Whitechapel investigation in the fledgling days of tabloid journalism and clinical psychology. This astonishing debut explores the terrifying prospect of hunting down one of the world’s first serial killers without the advantage of modern forensics or profiling. Sherlock’s desire to stop the killer who is terrifying the East End of London is unwavering from the start, and in an effort to do so he hires an “unfortunate” known as Mary Ann Monk, the friend of a fellow streetwalker who was one of the Ripper’s earliest victims. However, when Holmes himself is wounded in Whitechapel attempting to catch the villain, and a series of articles in the popular press question his role in the crimes, he must use all his resources in a desperate race to find the man known as “The Knife” before it is too late. Penned as a pastiche by the loyal and courageous Dr. Watson, Dust and Shadow recalls the ideals evinced by Sir Arthur Conan Doyle’s most beloved and world-renowned characters, while testing the limits of their strength in a fight to protect the women of London, Scotland Yard, and the peace of the city itself. The world’s most famous detective is on the trail of the world’s most notorious killer. In an interesting though not unprecedented mash-up, Faye attempts to bring Sir Arthur Conan Doyle’s Sherlock Holmes and cast to bear on the perpetual mystery of the Jack the Ripper killings. To any of Doyle’s fans, the style and language is immediately recognisable. Dust and Shadow is written from the perspective of Doctor John Watson’s memoirs, as all of the original Sherlock Holmes stories are. Aside from a few minor hiccoughs where a word does not seem to quite fit, the grammar and linguistic usage feels genuine and impeccably researched. Even the few portions that don’t feel quite right are quickly forgotten. Dust and Shadow is significantly longer than any of the original Sherlock Holmes adventures. While this has been done in order to fit in all of the grim events of the Ripper murders, it has the side effect of necessitating a larger than normal cast and a more intimate acquaintance with regular members. Of particular note in terms of new characters are Miss Mary Ann Monk, a down on her luck dolly mop who ends up aiding Holmes and Watson in their investigation and Steven Dunlevy, an investigative reporter who is pursuing his own case. These characters are well rounded and speak with their respective lingo and feel very authentic. Lestrade and Mycroft Holmes return, as well as the Baker Street Irregulars. In some interesting twists, some of the Irregular’s families are introduced and used in portions of the investigation. It is gratifying to see the street arabs being given a more human aspect, rather than being used purely as a Deus Ex Machina as they were by Doyle. Over all, they do not feature prominently in the story and are as much fan service as plot elements. Mycroft Holmes, Sherlock’s brother and a generally shadowy figure makes a more defined series of cameo entrances, and Watson spends some time expounding on the nature and position of Mycroft’s involvement with the British government. Mycroft himself is rarely mentioned, much less his employment in the majority of Doyle’s Holmes stories so it is somewhat unusual to hear his name so casually tossed about during Dust and Shadow. Lestrade has a much more prominent than usual role, being one of the chief investigators in to the killings. Lestrade seems both far friendlier and more competent than in his original portrayals. Watson seems largely unchanged by the transition to a new author. Of greatest note is Holmes himself. Even at the best of times, Watson’s companion was acerbic and combative. He never missed an opportunity to deride the work of the police force who he constantly ran rings around. In Faye’s novel, he seems much more willing to utter conciliatory words, share his discoveries and even ask for help. All these changes do make Holmes’ character more believable, but also take him a little bit further from canon than is comfortable. Holmes’ famous observational deductions make a tour de force return, and are generally satisfying and believable. There are a few instances where this is not the case, and although the deductions may have made sense to a Victorian, are completely nonsensical to a modern reader. One line that especially irritates is a reference to Holmes recognising a smoker because he “had cashews”. The best answer that modern search technologies can provide is an obtuse reference to not smoking and eating cashews in order to get rid of wrinkles. The story itself follows the “canonical five” killings (Mary Ann Nichols, Annie Chapman, Elizabeth Stride, Catherine Eddowes and Mary Jane Kelly) as well as one of the first Whitechapel murders of Martha Tabram, who has never been definitively linked to Jack the Ripper. Faye has obviously gone to a lot of trouble to research the killings and their locales. The descriptions of the corpses, their states and the places in which they were discovered have been portrayed with a relentless and disturbing factuality. Some of the people who were involved with the killings in reality also make appearances in the book, most notably including George Lusk of the Whitechapel Vigilance Committee. The story is suspenseful and intriguing, despite the fact that it occasionally can’t sustain the suspension of disbelief of the reader. Faye does not take any cheap short cuts (Such as having Holmes catch the killer after the first murder), but incorporates as many of the facts as it is feasible to. The ending is satisfying, though not grandiose and “feel-good” as are many of today’s stories. The closing passages definitely fit in with the Sherlock Holmes mythos. The biggest problem with the book is a paradox and not easily solved. The story is quite good and enjoyable, though it would not really work as well without the use of Sherlock Holmes and cast. At the same time, with the changes made especially to Sherlock’s personality – which are arguably necessary to move the plot forwards – the story still doesn’t quite feel like a Holmes book. In the end, Dust and Shadow is an excellent crime novel and period piece that is well worth a read even if it does twist Doyle’s characters a little more than some would like.